Greetings from Jakarta, where I am visiting for a whirlwind 7 days of presentations, meetings, and the grand opening of the Jakarta office of the American Institute for Indonesian Studies. Our approach is political: we think that where there is robust political competition among local parties and elites, you are less likely to find these surpluses. For more on why that is, and how we can show it, you’ll have to read the paper; for you to read the paper, we’ll have to write it first! But in the course of this research we examined the factors that affect political competition, and one such factor is social cleavages. So here is an interesting, and frankly puzzling, scatterplot of social cleavages (as measured by ethnolinguistic heterogeneity) and political competition (as measured by party fractionalization within local DPRDs). When you look at this graph, you’ll conclude that, as you might expect, when ethnolinguistic heterogeneity is high, political fractionalization is high. But you’ll also find that when ethnolinguistic heterogeneity is very low, political fractionalization is high. A non-parametric lowess fit (the red line) illustrates this, and a polynomial regression (shown below the graph) is consistent with this interpretation. I don’t have a ready explanation for why this is. One of the purposes of my presentation is to get some feedback from on-the-ground experts, but I’d also be happy to take suggestions from anyone who happens across this. I’d argue (based on my time running a nonprofit in East Timor and seeing a lot of communities there) that this makes perfect sense. When there’s high fractionalization folks define themselves across group lines and competition is high; in the middle ELF-wise often self (and political) definition is still on EL bases and one group can dominate (so competition is lowest), will work things out internally to avoid what I think of as Bull Moose-ing (splitting a winning coalition so as to lose to a numerically smaller group in a FPTP system). Thanks, Dan, for your thoughts. That’s roughly the sense that I have about what happens at the low end of ELF, I’m just having a rough time putting this in more theoretical terms or looking at other parallel instances of this. Thanks for reading! Interesting, why did you choose ethnolinguistic fractionalization? I don’t believe ethnolinguistic fractionalization is the cause, because Indonesia’s political parties are not based on ethnolinguistic alliances – but religious lines more likely. In reality whenever there is a Bupati/Walikota or governor elections, it is not uncommon if the incumbent stalls the allocated spending and disburses the spending only near the elections time – in the hopes of winning votes. Then again with measuring political competition, usually political parties “sell” their electoral tickets for the incumbent or any other contesting candidates, so alliances or ideologies don’t matter as long as you have the cash. Thus, one way of interpreting your scatterplot is, there’s no correlation with any alliances or political competition because it all boils down to practical politics in Indonesia – money. Nothing to do with ethnolinguistic lines. I agree that national political parties are not ethnically constituted, but local politics–local elections–are often imbued with ethnic symbolism. Ed Aspinall has written about this. 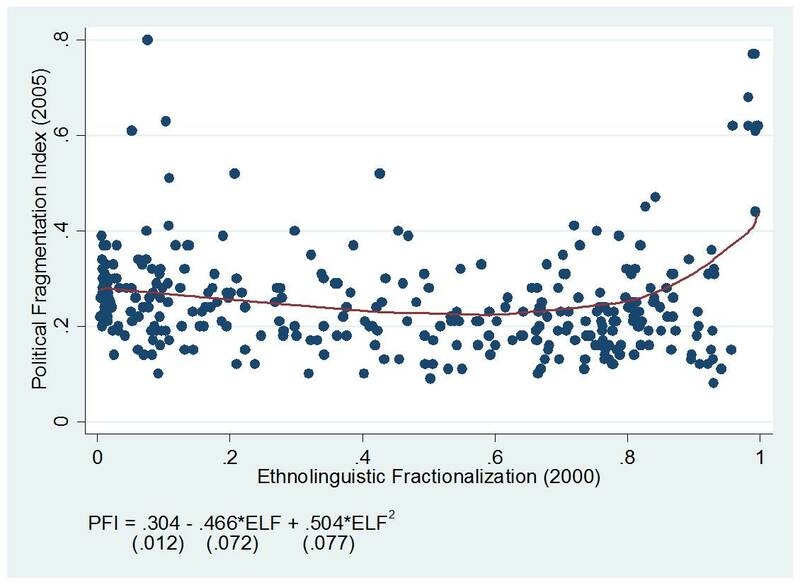 For that reason, it makes sense to check whether ethnic heterogeneity is associated with political fractionalization. Of course, this is just a hypothesis, and you could be right that they are unrelated. But the data don’t seem to support that. Broader point: of course local elections are about money. But some districts feature money politics with lots of different competing parties, and some districts feature money politics with just a couple of parties. That’s variation that we want to explain.